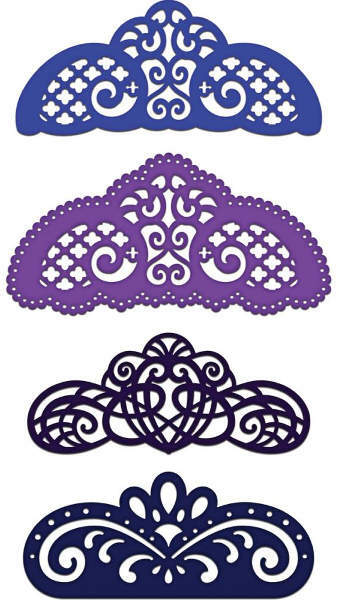 Create ornate and delicate tag toppers, beautiful borders and whimsical pockets for use in all of your paper projects using the Ornate Borders and Pockets Die. The perfect embellishment pieces for mini albums, cards, scrapbook layouts as well as altered art projects. Ornate - 3.75" x 1.5"
Ornate Background Border - 4.0" x 0.15"
Ornate Scalloped Background/Border - 4.5" x 0.25"
Ornate Intertwined Scrolling - 3.5" x 1.5"
Ornate Intertwined Scrolling Background/Border - 3.75" x 0.15"
Ornate Scrolling - 3.5" x 1.5"
Ornate Scrolling Background Border - 4.0" x 0.15", 3.75" x 0.15"
These dies compliment the 3D Flip Fold Album along with the Pocket and Flip Fold Insert Packages A, B, C & D.